Amy Poehler: We Need Parks and Rec's Leslie Knope Back "Badly"
Somebody get the Leslie Knope signal (which would totally be a waffle) into the sky, she's needed! E! 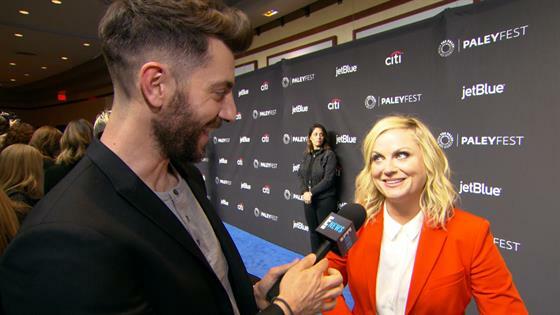 News was on the red carpet for the PaleyFest panel in honor of Parks and Recreation's 10th anniversary of premiere and spoke to Amy Poehler, the woman who brought Leslie to life for seven seasons, about her iconic character and what she'd make of the current political landscape. "Yeah, she would [be disappointed with politics today], she really would," Poehler told E! News' Will Marfuggi. "She'd be totally flustered by the fact that people aren't working together and people are lying and not looking out for the little guy…She would be having a struggle right now, I think. Yeah, we need her badly. She's like the Spider-Man of politics. Parks and Recreation was set in the "real world" and previously featured politicians guest starring as themselves. John McCain, Joe Biden and Michelle Obama are all former guest stars. In Parks, Leslie Knope was the deputy director of Pawnee's parks department before dipping her toe into politics, first with the city council then taking a job with the National Park Service and the with the Department of the Interior before, in a flashforward, possibly becoming the president of the United States. "She is the person I wish I could be," Poehler said about Leslie Knope. "She represents a political, public servant who cares about her job. It's awesome." However, we won't see new adventures of Leslie Knope any time soon. "I think that, you know, in the world that we live in now nothing is ever gone, everything comes back into cycled through again and, you know, I would only say that I think we would just all—everyone on this stage, and like six other people—would have to feel like there was a story that needed to be told," series co-creator Mike Schur said while on the reunion panel. Be sure to watch E! News for more on the Parks and Recreation reunion.